Our friends at the Huffington Post wrote a great list, 13 Signs You Might Be a Suburban Mom. 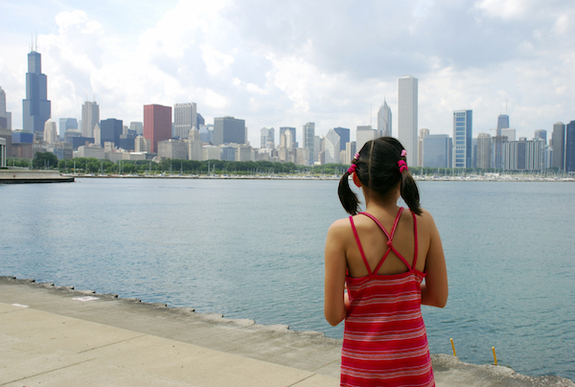 We couldn't get away without creating one of our own about Chicago moms, too! 1. You know how to navigate public transportation with a diaper bag and a stroller. Oh, yeah, and a child. 2. Sometimes you get lost in Whole Foods, for hours. 3. You purge your baby stuff, almost immediately. Who's got the room for it? 4. You are flexible. If there is a Cubs game, you know which parks are away from the traffic pattern. 5. You know when the museums won't be swamped with out-of-town tourists (spring break and holidays). 6. Riding a train is no big deal to your kid. 7. Your child prefers a scooter to a bike and so do you. 8. You run into friends at the park, and you are never the only one there. 9. You've held a birthday party or play date in your "outdoor space," the sidewalk. 10. You've become a Wiggleworm groupie and follow your favorite kindie performers from stage to stage during summer festival season. 11. Your child knows every Divvy location within a 2-mile radius and can explain to out-of-towners exactly how it works. 12. When you child comes into contact with "nature" (i.e., a yard), she is awestruck and refers to trees as the "forest" while you chuckle to yourself. 13. Your child has NO idea the lengths you go to get him signed up for Park District programs, but you happily do it anyway.